I was really looking forward to a five-hour dinner cruise along the Na Pali coast of Kauai while we were in Hawaii. Captain Andy’s crew double checked ahead of time to make sure they had food on board that I could eat. Unfortunately, I was too seasick to eat the lovely dinner they cooked special just for me. (Five out of the nine in our group were also too sick to eat.) Still, it was a fascinating excursion and I’m not sorry I went. The captain narrated the history of the places we passed, including the endless stretches of barren coastline that had lost all its native vegetation when the land was originally cleared for raising sugar cane. The cane fields are long-since gone, but sadly, the land has now been taken over by Monsanto for testing GMO corn. Allerton Garden seems to supply almost every human need. Food literally drops from the trees. Medicinal plants, spices, edible leaves, roots, nuts, and fruits abound. 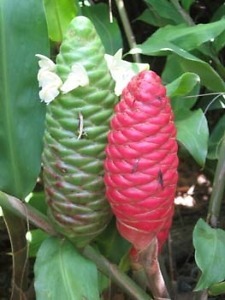 It has a buzzing tree full of honey and gorgeous lipstick palms that were used to make red sealing wax. A squishy fruit from a variety of ginger oozed a sticky, sudsy syrup that could be used as shampoo. Our tour guide asked for volunteers to sample a fruit he picked from a large shrub by the path, called a noni. He said he ate one every morning because it was good for him, but that it smelled like dirty socks. I think I was the only one who took him up on it; it tasted like dirty socks. There’s no shortage of protein sources on Kauai either. The island has been over-run with the descendants of domesticated chickens that were released by hurricanes that struck in 1982 and ’92. Chicken images have replaced hula girls and palm trees on souvenirs and tee shirts. Hens with chicks in tow parade boldly underfoot while the sound of crowing is now more common than ukulele and steel guitar music. With no natural predators, the chickens have de-volved into colorful, wild jungle fowl. The only evidence I saw that anyone was taking advantage of the free KFC-on-the-hoof was a listing for “wild chicken” on one restaurant menu. Scientists are studying the DNA of the feral chickens to help them understand the domestication process. If civilization is on the verge of collapse, as the doom-sayers speculate, Kauai might be good place to start over. I’ll be on the last flight out. Want to join me? On a sight-seeing drive up to Kokee State Park, we stopped at a roadside stand where tourists were lined up to buy tropical fruits, cold drinks, and home-made goodies, like fried apple-bananas (an extra sweet variety) and banana cake. There was a sign on the counter offering freshly made coconut tapioca desserts, a local specialty. The vendor caught my eye as I was looking at them and said, “Soooo good!” They were not low-carb, but clearly a better choice than the sweet fruits, soft drinks, and pastries. She was right. It was just a slightly sweet pudding, but truly delicious for something so simple; it contained just fresh coconut water, shredded fresh coconut, and tapioca. I thought it would be easy to find a recipe for this authentic Island dish when I got home, but I should have asked more questions. All I could find were ordinary coconut puddings made with corn starch. So, here goes; this is my attempt to replicate the flavor and texture based on my sample of one serving. 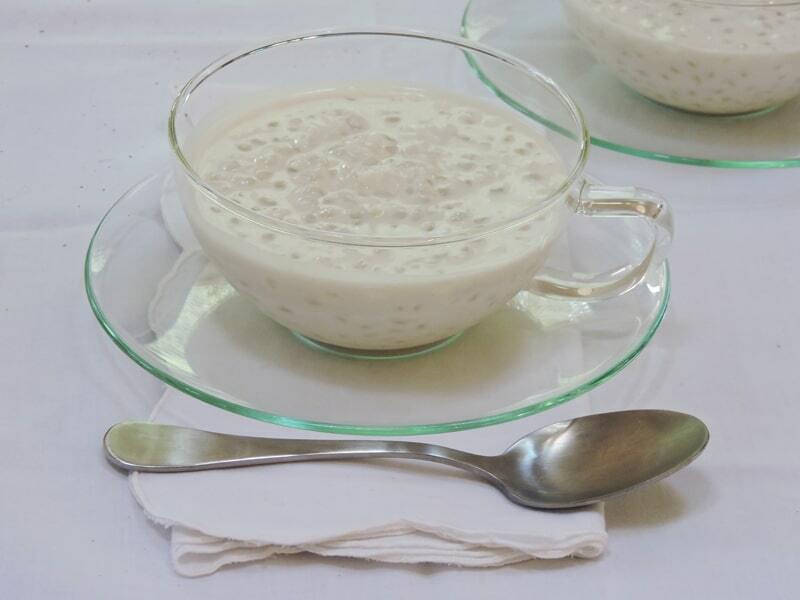 I had some fun bashing shirataki noodles in a previous post about them here, but they make a perfect zero-carb replacement for pearl tapioca in this recipe. I included a little tapioca for authenticity but used eggs as a non-starchy thickener. ½ cup grated or shredded fresh coconut **See Notes. Place tapioca pearls in ¼ cup of water in a medium saucepan and let soak for 30 minutes. Do not drain. Add coconut milk and rinsed and dried shirataki rice (see Notes for instructions). Set pan over low heat and cook and stir until it starts to thicken, about 5 to 10 minutes. Whisk eggs in a small bowl until smooth. Dip out ¼ cup of the hot liquid and whisk, a little at a time, into the beaten eggs to temper. Scrape egg mixture back into pan and cook and stir for a few minutes more until eggs are cooked and mixture is thickened. Stir in shredded or grated coconut, vanilla, and coconut extracts, and salt. Place in a bowl or serving dishes. Serve warm or cold. Makes about 3 cups or 6 servings. Drain shirataki and place in a strainer. Rinse under cool water for 10 to 15 seconds. Heat an inch or 2 of water to a simmer in a non-oiled pan. Add the shirataki and simmer for 2 minutes. Drain off water and return shirataki to pan. Heat and stir over medium heat for 2 minutes until dry. Makes about 1 cup of shirataki rice. Set aside until needed. Use a power saw to cut the coconut in half or use an awl and a hammer to cut a groove and split the shell, being careful to protect yourself from flying pieces. (Some stores will open them for you.) With a blunt knife or a chisel, pry the meat from the shell in large pieces. Remove the brown peel that adheres to it with a vegetable peeler. Shred ½ cup of the coconut meat into thin strips on the large holes of a box grater or grate it as finely as you like. Set aside until needed. Save remaining coconut meat for another use. (c) 2016, Judy Barnes Baker. Photo of Mermaid Room and Shampoo Plant from Allerton Gardens website. 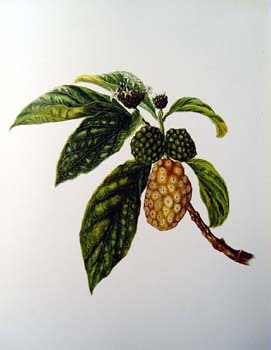 Noni plant from the National Tropical Botanic Gardens database. 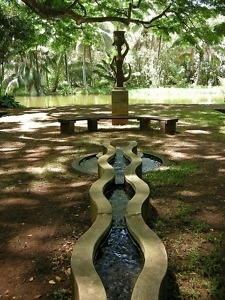 Allerton Gardens, GMO, Hawaii, Kauai, Noni, Shampoo plant, wild chickens. Bookmark.